Jack & Muvva posing for a selfie! 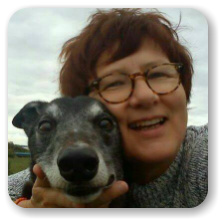 Did you know we have our very own Ambassador, Jack Alford who in addition to spending his precious awakeness hours promoting the Great British Greyhound Walk to sighthounds everywhere, also runs fun competitions on our Facebook page! Go take a look at the latest – a Selfie Competition!